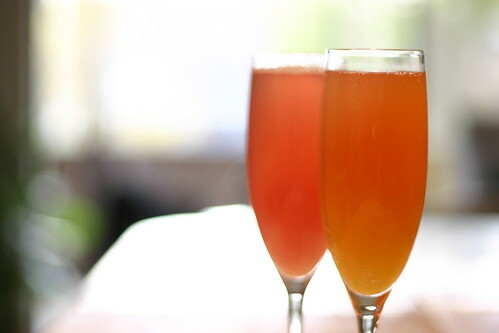 The Bellini is an Italian classic that is truly brunch worthy. This drink is fresh, fruity and light. Perfect for a brunch cocktail. While traditionally, and I’d guess best, made with pureed fresh peaches, I’m going for simple this week and only touching the surface of what’s possible. So, given that, I used Kern’s fruit nectars to good success. Wanting to change things up a bit, I tried mango and guava nectars in place of peach. Both were quite tasty and the resulting colors were striking. If you’re truly making this one for your mom I would definitely go the extra mile and make it with fresh fruit. However, for you standard brunch canned nectar works quite well. I really don’t have much to add to this recipe, mainly because I didn’t spend a lot of time experimenting. Though, I can assure you I’ll be coming back to this one again soon. Look for it when Colorado peaches start coming in to season in the late summer.